On July 4, 1776 a group of wealthy, aristocratic landowners who had mostly enjoyed the favor of King George did something rather rash. They declared themselves, and millions others, independent from the rule of their tyrant King. Why did they sacrifice their very way of life for an ideal that had no guarantee of benefitting them? They knew they had a war to fight with the world’s preeminent military complex for making such a bold statement. What was in it for them? What was in it for them was being the patriarchs of a bold, new idea. An experiment. Could the governed actually govern themselves? To them, it was worth a try. It was worth a war. It was worth their very own blood. They knew their heads would roll if they failed and they signed that declaration anyway. Almost 237 years later, our experiment continues. It continues because the wealthiest and most powerful among us decided to risk their station in life for the opportunity for the rest of us to have a say in how we are governed. What they did was quite possibly one of the most selfless acts in the history of human governments. But that was 237 years ago. Where are such selfless acts today? Where are the politicians willing to sacrifice their own lives, much less their jobs, for the greater good? The truth is, what our patriarchs did is not possible without something else being involved. Something bigger than them. Something more powerful. We cannot hold together what was begun unless the Laws that govern nature are understood as being orchestrated by nature’s God. That, unfortunately, is not true in America anymore. We have chosen to remove God from every aspect of our corporate lives. We have become so adverse to God and His laws that our nation has made sure that they stay solely within the four walls of a church. Recent decisions by the Federal Government to force companies to provide abortofacient drugs, against the religious conscience of company owners, betrays the reality that we no longer hold Nature’s God in any esteem. Hobby Lobby is being fined millions of dollars a day by not providing these drugs that they believe their creator would not approve of. What this nation was founded on was a Creator. Our act of rebellion in 1776 AD was one rooted in the belief that God had greater purpose for our collective lives. Our patriarchs believed that God’s people deserved to determine for themselves how they should conduct their own lives, and for that, they were willing to rebel against their masters. Just as in the days when the Revolutionary War came to an end, we are today witnessing a nearing of the completion of another act of rebellion. But this time we are not rebelling against a foreign ruler with oppressive laws. No, this time we are rebelling against the very Creator we believed gave us the right to establish this nation. On Friday, May 10, 2013, One World Trade Center reached its full height of 1,776 feet. That number is synonymous to freedom in the eyes of most Americans, but 1776 brought no freedom to this nation. It only brought war. Why? Because the Declaration of Independence was our act of rebellion against King George. Our freedom was not secured until September 3, 1783 when the Treaty of Paris was signed. 1776 is the symbol of our rebellion. Why is the symbolic height of One World Trade Center so rebellious? Because God was not behind its construction. 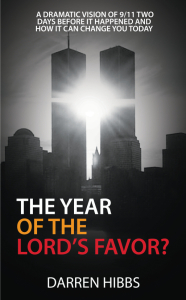 I have written about why in my new book, The Year of the Lord’s Favor? God loves this land and this people, but we must be willing to return to the notion that founded who we are. Until we are wiling to acknowledge “Nature’s God,” we will not be able to receive His blessing as a nation. But we can. God still offers us hope. He still offers us time, but not much more. We must act quickly. We must flee from the rebellion that stands 1,776 feet tall where we rejected God to follow man to the one that took place in 1776 where we rebelled against man so we could follow God. And there is still a little time to do so.